There is a fast realization that the outsourcing industry has reached a phase of almost insufferable tension. Why? Several of the RPA (Robotic Process Automation) solutions vendors are painting an over-glamorous picture of dramatic cost savings and ROI. RPA software firms are claiming - and demonstrating - some client cases where ~40% of cost (or more, in some cases) is being taken off the bottom line. While some of these cases are genuine, there are many RPA pilots and early-phase implementations in the industry that have been left stranded because clients just couldn't figure out the ROI and how to implement this stuff. This isn't simply a case of buying software and looping broken processes together to remove manual efforts... this requires real buy-in from IT and operations leaders to invest in the technical, organizational change management, and process transformation skills. Buyers are backed into a corner with broken delusions of automation grandeur as their CoEs fail. 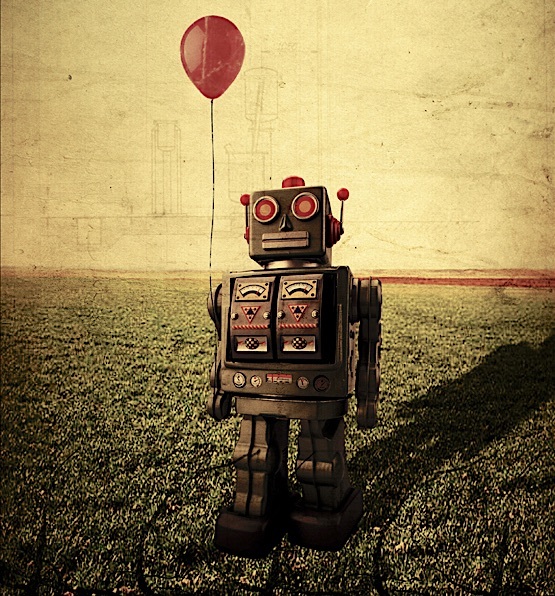 Buyer leaderships are being fed all this rosy information and are under incredible pressure to devise and execute an RPA strategy, with some sort of set of metrics, that they can demonstrate to their operations leadership. Many are quickly discovering they simply do not have the skills inhouse to set up automation centers of excellence and are frantically turning to third parties to help get them on the right track. Outsourcing consultants are selling RPA before they can really deliver it. Sourcing advisors are claiming they are now "RPA experts" who can make this happen, while struggling to scale up talent bases that can understand the technology and deal with the considerable change management tensions within their clients. RPA is murky and complex, and not something you can train 28-year-old MBAs to master overnight. Meanwhile, we are seeing some advisors simply do some brokering of RPA software deals for small fees, only to make a hasty exit from the client as they do not have the expertise to roll-out effective implementation and change management programs. RPA specialist consultants few and far between. Pure-play RPA advisors are explaining this is not quite so easy and requires a lot more of a centralized, concise strategy. There are simply not enough of these firms in the market, especially with Genfour having been snapped up recently by Accenture. With only a small handful of boutique specialists to go around, these firms can pick and choose their clients and command high rates. Service providers will set the pace, but many will destroy each other in the process. Service providers are claiming they can implement whatever RPA clients need, but are not willing to do it at the expense of reducing their current revenues. Meanwhile, smart service providers are aggressively implementing RPA into their own operations to drive down their delivery costs and reduce their own headcount. So we can expect to see providers aggressively attacking competitive clients with automation-led solutions that should create unbearable pricing pressures for service providers looking to retain the talent they need to implement this stuff. Hence, services providers will be hell bent on destroying each other and the winners will be those who eventually succeed in winning more work than they lose amidst all the destruction. This is a war of many battles being fought - and the winners will be those who are in this for the long haul, who can absorb some short-term losses to pick up the larger spoils further down the road when they have a fully equipped intelligent automation delivery capability that can deliver highly-competitive and profitable As-a-Service offerings. So we've reached crunch time. Whichever way we look at it, RPA has created a lethal environment, which was only just coming to terms with providers and buyers working together to get the basics of delivery right. Most outsourcing buyers have to look to automation to save their jobs and please their ambitious leaders, no longer content with the ~30% they saved on offshore-centric outsourcing just a few short years ago (see our recent State of Outsourcing and Operations data on 454 major buyers). So, in the meantime, for all the reasons outlined above, this industry will literally go into a destructive war over automation. The skills to make automation a massively profitable reality are few and far between, while greedy corporate leaders demand cost savings that simply are not achievable if their organizations fail to make the necessary investments and partnerships to make this achievable. Did companies become world class at HR overnight because they bought an expensive Workday subscription? Or stellar at sales and marketing because they slammed in a Salesforce suite? So why should they become amazing at cost-driven automation simply because they went and bought some licenses from an RPA vendor promising bot farms and virtual labor forces? Many great points in your post Phil. 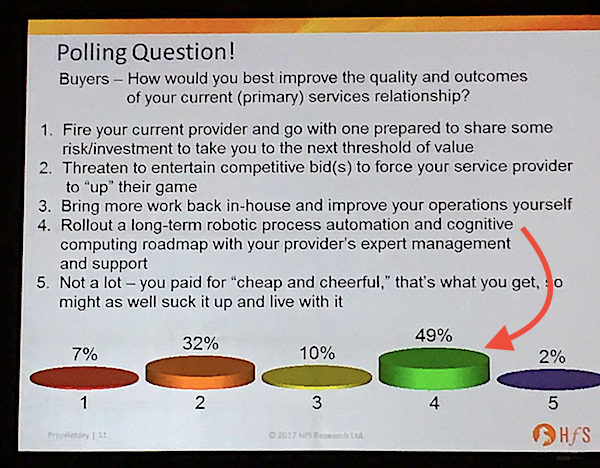 Providers are struggling mightily with RPA/automation in general and most are reluctant to cannibalize their revenue streams. Some might argue that there is a conflict of interest present in that scenario anyway. Many have built proprietary cognitive Watson like AI capability which is far upstream from RPA and basic cognitive, but that has little to do with RPA. Enterprises want to develop RPA COE's and need help to do. There are only a handful of scale size external RPA firms with greater than 100 team members; ISG is one of them. Genfour's acquisition by Accenture simply removed another good but sub scale player from the landscape. Change management is a HUGE factor in success in implementing RPA and ISG's capability there is a combination of legacy Alsbridge's offering and the formidable capability found in its prior acquired entity TracePoint. RPA's promise is real, large and realizable in very short timeframes. Help is available if enterprises want it. Phil - best piece anyone's written on the topic - gets right to the heart of the issues with RPA. Completely agree automation has created major tensions across the whole industry. I love the words of wisdom you leave us with: "Start with one process at a time, prove how to fix in, then onto the next, then the next". Brilliant stuff - you are a credit to this industry! Great stuff Phil, Practical thinking and true facts reflect clearly in the writing. The industry with its past experience of many such disruption like ERP, IVR, factory modelling, CRMs, automation software, workload and list is endless. Agree RPA trumps them all but the basics of success will remain same. Investment, intent, partnership, practicality and reliability. The article is aptly titled. Appreciat a very well written article on the current and latest crossroads situation the IT industry in particular is facing today. Phil- Great synopsis. As always the truth is always somewhere in between the extremes. It will take some good buyers, good providers and great consultants to truly set the tone for automation driven future which is closer then ever before now. Very insightful article. Will be very interesting to see who will be the survivors. Good read Phil. The phase is truly underway. Execution will seperate the men from the boys. Will be interesting to see who will be the last few standing when the dust settles. Thanks Phil & Team. I continually make many of the statements above, but it's great to hear another independent voice on the topic. There is too much disinformation flying about saying that Automation can deliver huge benefit and be implemented in ' a few weeks', but you know what they say about something that sounds too good to be true! IA is truly transformative and can deliver significant ROI, but only if applied to the right process areas and delivered with the optimum focus and discipline. @Chip - good to hear from you. Am interested in ISG's complex technology transformation and change management competencies for RPA - is this an area where you are doing a lot of work with clients? Do you have a specific training program established internally to shift your outsourcing consultants into RPA? Very balanced view from HfS on the question of "automation versus outsourcing". Indeed clients are looking for partners who can apply the right combination of insight, analytics, automation, platforms and operational solutions to a given customer or business problem versus arriving with a preset solution. Winners will navigate the legacy and the new. Brilliant article Phil.. Providers must produce Use Cases backed by substantial and quantified benefits to Buyers before long term benefits can be reaped. Terrific all to arms, Phil! RPA is a reality and BPO companies need to reinvent themselves to become "advance BPO" organizations ... it is an opportunity, not a threat. We are at the cusp of "creative destruction" - change that will destroy old economic structures and create new ones leading to abundance. History is witness to that as we have seen 3 Industrial revolutions from Loom to steam engines to assembly lines , all these disruptions have led to greater good. And so will AI and cognitive sciences ! While a lot of comments are true arnt we shooting the horse before it can run.with any new technology/framework the foundation has to be first prepared -this all the more true in the case of rpa where you need to re-engineer some process before you can automate.so the question is are the platform providers along with clients doing this with the consulting companies or is everyone just throwing the problem over the fence to get ahead of the other ? While Change Management is the key it would be essential to have an integrated strategy to consider things like people, processes, business integration, IT landscape, governance and maintenance, security, auditability, engagement models, delivery models to be able to build a successful bots delivery capability. Your post is a must-read for anyone working in and around RPA today. Thanks for continuing to provide an unvarnished and authentic reflection of prevalent perspectives in the marketplace today. RPA is innovation at its best. Scrappy. Tactical. Good enough for today and with essentially unlimited potential for future impact thanks to exponentials. We are barely scratching the surface of how far we will go with the concept of human augmentation and simulation in the enterprise, professional services and beyond. RPA is a child of the digital era we are in that will grow up with us in the cognitive era to come. It's just one member of the next generation of transformative exponential technologies. My perspective is not whether to participate, but when and how to do so to create the greatest value as an enterprise. The answer is different for everyone and an enterprise's accurate self assessment of their competency vs. their appetite for change is what will help them work out their need for advisors vs. DIY and buy vs. build. The winners in this field will be those players, be they end users, advisors, service providers or RPA software companies, that are bold and audacious but also ruthlessly pragmatic and realistic. So, here's to keeping it real, Phil! After a long time we are seeing real analysis on technology which makes sense. Thanks for this great report. RPA is essentially a process solution and not IT solution and this has to brought into perspective in any buying decision. As with any process solution - organization inertia will be a factor.